Blog Clean or re-cover your beloved upholstery? Should you clean or re-cover your upholstery? For many people, replacing their sofa or armchair just isn’t an option. Maybe it goes with their decor, or it’s been in the family for years and years. If you’re in this situation, today’s blog will give you our honest advice on whether it’s time to re-cover your upholstery or whether it just needs a clean! Clean or re-cover your upholstery? It’s looking a little worse for wear, but you are undecided whether to clean or re-cover your upholstery? 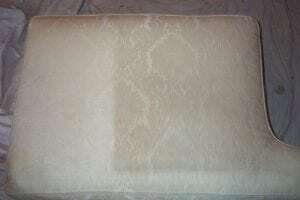 In most cases it’s much cheaper and less hassle to have your upholstery cleaned. However there are some cases where we would recommend you re-covering it. Generally we advise that if your upholstery is visibly worn or damaged then re-covering it might be the best option, as cleaning will do little to help this. Similarly if you have ground in stains that won’t budge, again it might be time to re-cover your upholstery. …but how do I know if the stains are going to come out? There is a BIG advantage of us looking at your upholstery first. We will give you our honest opinion on whether stains are going to come out or not. We will tell you if your worn sofa is not going to look much different! Now, you might be thinking, you’re an upholstery cleaner, you’re not going to persuade me not to have my sofa cleaned! Well, the fact is that Careclean offers a full refund if customers aren’t 100% satisfied with the work. Therefore we won’t make promises we can’t keep! We will give you our honest and professional opinion and you can decide from there. So, what do you think? Still undecided on whether to clean or recover your upholstery? Give Careclean a call today on 01245 323989 to book in your free quote and get our expert advice. … and if you are undecided… just look at the difference we made on this sofa cushion! Want to read more about our upholstery cleaning process? Click here! Meanwhile, you can learn more about our carpet cleaning services here.